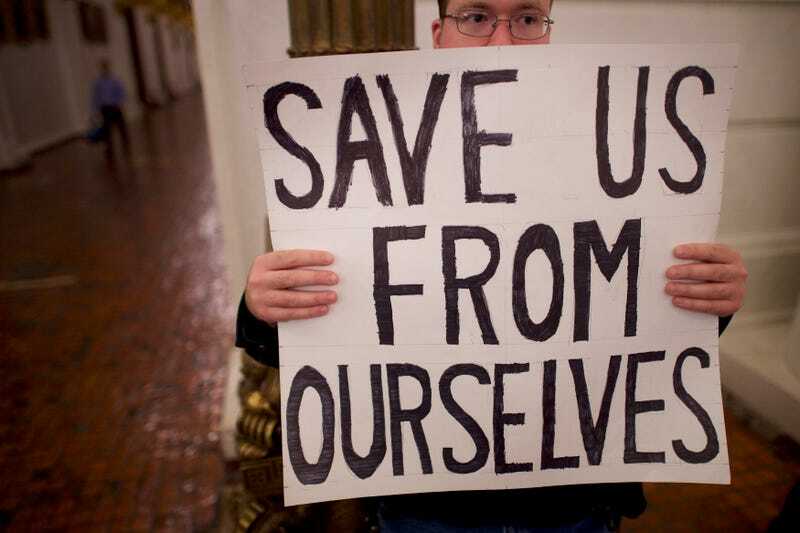 A Donald Trump protester joins demonstrators inside the Pennsylvania Capitol before electors arrive to cast their votes from the election on Dec. 19, 2016, in Harrisburg, Pa. Many of us hoped that the Electoral College would throw a Hail Mary and get us out of the inevitability of a Trump presidency, but alas, that did not happen, and on Monday the electors gave him the votes he needed to officially become the 45th president of the United States, the Washington Post reports. Trump became the winner after electors from Texas cast their ballots and put him over the 270 votes he needed to win. The results will be officially announced Jan. 6 in a special joint session of Congress. Although Hillary Clinton won the popular vote by a margin of nearly 3 million votes, Trump won the state-by-state electoral map, and as the Post notes, that controversial win sparked special scrutiny, intense lobbying of electors by Trump opponents and widespread, mass protests against his presidential win. News of possible Russian involvement in the election results raised doubts about the legitimacy of Trump's win and led to what the Post describes as mostly symbolic calls for the Electoral College to reject Trump as the next president. According to the Post, although Trump has dismissed the intelligence community’s analysis of Russia’s role in the election and boasted of a “historic” landslide, his 305-232 win over Hillary Clinton ranks just 46th out of 58 Electoral College results. Republican Ohio Gov. John Kasich earned a vote from an elector in Texas, as did former Rep. Ron Paul (R-Texas). Three electors in the state of Washington cast votes for former Secretary of State Colin Powell, and another cast a vote for Faith Spotted Eagle, a member of the Sioux tribe from South Dakota who opposes the Dakota Access Pipeline. Sens. Susan Collins (R-Maine) and Elizabeth Warren (D-Mass.) both earned elector votes for vice president in Washington state, but in the end, Indiana Gov. Mike Pence earned the required number of votes to serve as vice president. Former President Bill Clinton cast one of New York state’s 29 electoral votes for his wife. “I’ve never cast a vote I was prouder of,” he told reporters. The Post reports that across the country, Trump critics gathered outside state Capitols hoping that electors might put a stop to a Trump presidency, but despite the pleas of his opponents, most electors had said for weeks that they would cast votes reflecting the will of their home states. While the U.S. Constitution does not specify how electors should vote, some individual states have rules that bind their electors to the results of the popular vote, and some state parties require electors to take a loyalty pledge to serve. Our next move as a country should be to do away with the Electoral College. It is an antiquated system that was put into place at a time when our country was a lot smaller and the political landscape was a lot different. It no longer serves the will of the people, and never has that been more evident than in the outcome of the 2016 presidential election. Let’s work together to figure out what we need to do to change this.